RedDoorz, one of the leading online budget hotels booking platform in Southeast Asia, announced today its expansion into its third market in the region – the Philippines. Currently with operations and properties in Indonesia and Singapore, RedDoorz intends to tap onto the dynamic growth of the budget hospitality and travel sector in the 7,000-island archipelago country by making an investment of more than US$5 million where it projects to grow its footprint to 100 properties across the Philippines over the next 12 months. According to a joint study titled “e-conomy SEA: Unlocking the $200B Digital Opportunity” by Google and Temasek Holdings, it found that the Philippines ranked second after Indonesia as the world’s fastest growing internet market with the potential to grow by 11 per cent in CAGR to 93 million internet users by 2020. This also meant a vibrant outlook for the online travel market in the Philippines, specifically for online hotels and airlines, which is expected to grow approximately five times from US$1.1 billion in 2015 to US$4.6 billion by 2025. In a 2018 report by WeAreSocial showing digital usage in the Philippines, it revealed that the Philippines not only has 67 million Internet users, but all of whom are also active on social media – of which more than 60 million were either unique mobile users or active mobile social users. With its entry into the Philippines, RedDoorz will also be introducing a new category of properties. 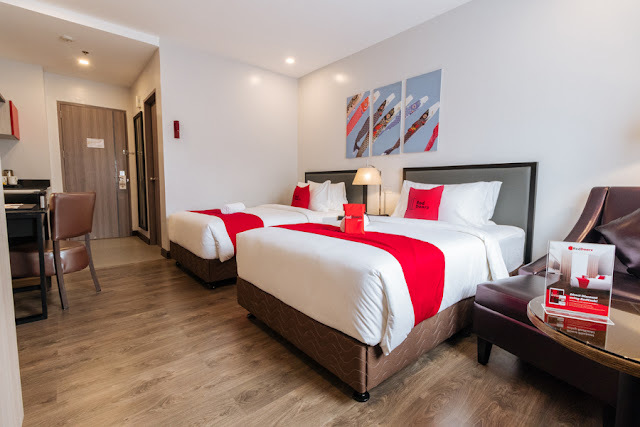 Adding on to its existing two categories, RedDoorz and RedDoorz Plus, the new RedDoorz Premium, launched in June 2018, are properties that are designed for the budget business traveller – not only strategically located close to business districts but have more amenities than the other two existing categories on the RedDoorz platform. The World Travel & Tourism Council found that domestic travel spending in the Philippines generated more than 86 per cent of direct travel and tourism GDP in 2016 and is expected to grow 4.8 per cent per annum to PHP3,336 billion by 2027. Additionally, in the same year, the Philippine Statistics Authority found that domestic travel rose by 20% from the figures in 2012 – this reinforces findings from the 2016 Household Survey on Domestic Visitors (HSDV) where three out of five Filipinos (59 per cent or close to 61 million) 15 years or older travelled within the country that year. With a high penetration of Internet activity as well as a year-on-year growth in not only domestic but also international travel, the budget hospitality segment holds a key driver for the tourism industry in the Philippines. With a strong local team on-the-ground coming from diverse backgrounds as well as a deep knowledge of the local travel and hospitality sector, RedDoorz runs a full operations unit in in Manila ranging from customer service, operations and product sales to branding, finance and marketing. RedDoorz has developed its own proprietary technology using data analytics to accurately forecast demand on areas that could have more hotels or properties to drive more footfall for travellers. Over the past 18 months, RedDoorz has trained over 2,000 staff across properties in Indonesia and Singapore. As part of their inhouse training programme RedPro, the brand runs ongoing programmes for the staff of their partner properties and ensure smooth running of their properties. Training is conducted across areas like: technology, housekeeping and maintenance, sales and marketing, and more. RedDoorz has a strong team of over 180 staff across four countries that specialises in operations, sales, marketing and all aspects of hospitality. Headquartered in Singapore, RedDoorz recently raised its Pre-Series B round of US$11 million as an additional investment from Asia Investment Fund of Susquehanna International Group, International Finance Corporation (private investment arm of World Bank Group), InnoVen Capital (venture lending firm owned by Temasek Holdings and United Overseas Bank), and Jungle Ventures – all of which had invested in past funding rounds. This fundraise also saw new investors DeepSky Capital, FengHe Group, Hendale Capital as well as other investors.